Concrete cracks are repaired using different techniques and methods, such as epoxy injection depending on how wide, long and/or deep the crack is. Most of the concrete cracks are related to shrinkage, heat, wrong joint placements, over stress and loading conditions and movements caused by external factors. Some of these repairs are completed by using epoxy injections applied directly to the crack. The procedure is different and varies depending on the crack location and whether the concrete cracks are horizontal or vertical. Some cracks might require additional steps, but this article will focus on concrete cracks repaired using epoxy. 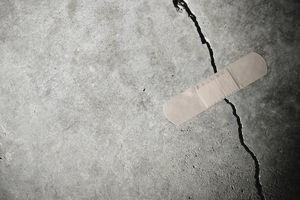 The recommended process of injecting epoxy into cracks might vary but here are some general recommendations to follow when repairing concrete cracks. When cracks go through a concrete surface, and there is visibility from both ends of the concrete element, the epoxy can be injected from both ends. Sometimes the application might require to make the epoxy more flowable or use another method to inject the epoxy into the concrete. The builder might also want to inject the epoxy more closely than usual so it gets into the deepest part of the concrete crack. Before deciding whether or not to use the epoxy repair, you will need to confirm that the cause of the crack is solved and no further movement is permissible. When the concrete is still subject to additional movement, then the epoxy injection process is not recommended. There are some instances on which this process is not recommended. Structural cracks or cracks that are wide enough should not be repaired using this method, instead, consult your engineer and determine whether some chipping and demolition are needed. When there is water into the crack and cannot be dried out, make sure to use a water repellent epoxy product. Concrete cracks due to corroded steel should not be repaired using the epoxy, as the steel will continue to decay and new cracks will appear. Kits for concrete repair are available handling cracks up to 1/4 inch wide. You should start by cleaning the crack area extending up to half an inch to each side of the crack. This is needed to secure a proper bonding to the existing concrete crack. It is recommended to use wire brushes to clean the area or use a high-pressure water jet to clean the area, but allow it to dry before starting the process. If you are under time constraints, air dryers can be used to eliminate the moisture and water from the crack faster. Mechanical tools are not recommended as additional debris might fall into the crack. The ideal crack repair process might require widening the crack into a "V" shaped until the crack is no longer noticeable. "V" shaped cracks will also generate a more resistant finishing. The epoxy is injected using the ports, two at a minimum, that eliminates the need for drilling. The ports are to be spaced properly allowing the epoxy to be injected at the right locations. The recommended spacing for the ports is eight inches apart along the concrete crack. Once the ports are installed, you will need to seal the top of the crack. Cover the concrete crack using an epoxy paste (can be applied using a putty knife) along the crack length that will dry in about 30 minutes. This paste needs to hold up during the pressure injection process. When the concrete temperature changes, it might affect the seal and adhesion of the epoxy paste over the concrete crack. Start by injecting at the lowest port and keep applying until the epoxy is coming out of the next port or when the epoxy is no longer flowing. On horizontal cracks, start at the widest point of the crack to inject the epoxy. You might want to close the second port as this might help to accommodate the epoxy below the concrete surface. Repeat the process until no more epoxy is flowing and then remove the cartridge. Move to the next open port or to the one that has epoxy coming out of it, and inject more epoxy. If the epoxy is hardened, move one port forward and repeat the process. It is important to apply constant pressure so the epoxy can flow adequately without leaving voids below the surface. Once the injection process is complete, remove the ports and the top seal from the crack. Start with a low-pressure injection setting and increase the pressure as needed. Larger cracks require more epoxy injection pressure. When filling wide cracks, wait some time, not a lot, ensuring that the epoxy is filling the concrete crack. Remove the top seal using a chisel or scraper. You can also use a heat gun to remove the epoxy paste. Watch out for epoxy backflow as that could be a result of debris blocking the epoxy flow or perhaps the crack is not continuous. If there is a leak in the top seal, use a crayon to seal the small leaking area. This is only recommended when it is a small leaking area. Maintain the ports at least for 48 hours to make sure the concrete crack is sealed. When the crack is too wide, the injection method might not work. Verify before proceeding that the crack is manageable and can be fixed using the crack kit. On narrow cracks apply a bead of caulk on the side of the concrete crack at least 1/8" from the edge of the crack. This creates an area that can be used to put the epoxy minimizing the waste.